Getting the best medical care possible for yourself and those you love can be challenging, especially when you realize that medical bills are the number one cause of bankruptcy, and medical and hospital errors account for more yearly deaths than car accidents. Inadequately diagnosed and treated medical problems can interfere with your feelings of self worth, mastery, control and your ability to earn a decent living to support yourself and family. 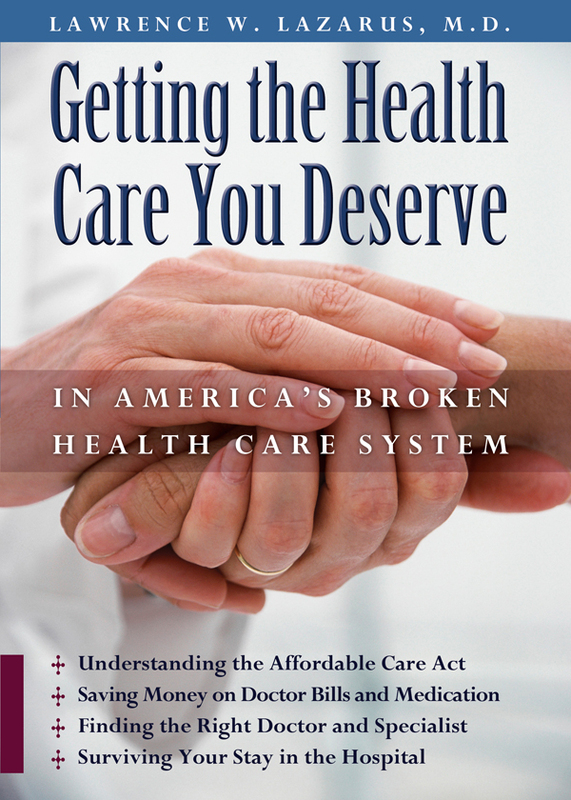 This book provides practical ways for reducing your healthcare costs, helps you take advantage of the Affordable Care Act (Obamacare), and shows how to find the best physician, specialist, and hospital for you and your family. You will learn ways to challenge and win if your insurance claim is denied and overcome psychological barriers to making realistic end-of-life decisions. Most importantly, this book will help you feel more mastery and empowerment when working collaboratively with your physician and other healthcare professionals. Dr. Lazarus shares with you his forty years of experience as a teacher, clinician, and researcher. He helps adolescent, adult, and elderly patients and their families better understand America’s complicated and often fragmented, healthcare system and helps them to obtain the care they deserve. You can purchase the book online from Amazon or Smashwords in multiple eBook formats at http://www.amazon.com/Getting-Health-Deserve-Americas-Broken/dp/0991018818. eBook formatting and cover design by Shelley Glasow Schadowsky.